Graphic by Stacy Rubinic/ The Jambar. Youngstown State University is struggling to maintain a racially diverse student body, and that group of students is struggling to succeed. Tiffany Anderson, an assistant professor of English and a member of the University Diversity Committee, said YSU has a diversity problem. At YSU, nonwhite students comprise approximately 26 percent of the 12,172 undergraduate student body. Fourteen percent are black, 3 percent are Hispanic and 1 percent are Asian — 4 percent of students’ ethnicities went unreported. 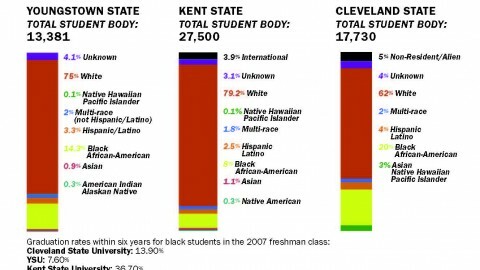 Despite the university’s minority enrollment profile doubling between 2001 and 2012, YSU is still below the national averages. According to Pew Research Center data released in 2014, 41 percent of students enrolled nationwide in college between age 18 and 24 are nonwhite, with 19 percent Hispanic, 6 percent Asian and 14 percent black. Of particular concern at YSU are retention and graduation rates. Even though black students are well represented in YSU’s student body, they are disproportionately impacted by this issue. The latest data shows that black students at YSU have a six-year graduation rate of just 8.5 percent for first-time undergraduate students who entered in 2008 — well below the national average for their peers of 43 percent. Of the 293 first-time full-time black undergraduate students who entered in 2008, only four graduated in four years and a total of 25 graduated within six years. Numbers were comparable in 2006 when only 8.6 percent graduated. By comparison, white YSU students do much better but still lag behind their peers nationally. Of the 1,413 first-time, full-time white undergraduates who entered in 2008, 38.36 percent graduated within six years. Hispanics fare well at YSU, but this could be due to the low sample size — of the 39 who entered in 2008, 33.33 percent graduated within six years. The total minority graduation rate for 2008 was 14.99 percent within six years. Fall to fall retention rates for first-year undergraduate black students fell 1.2 percent in academic year 2013-2014 from 46 percent in the previous academic year. Overall minority retention rate was 50.1 percent and white retention rate was 72.4 percent in same year. Jack Fahey, vice president of Student Affairs, said this was a pressing issue the university is addressing. Fahey partially attributed these trends to consistently poor socioeconomic profiles among YSU’s students — especially black students. In a 2014 Campus Completion Report to the Ohio Board of Regents, YSU reported that 88 percent of students receive financial aid, 48 percent are considered low-income students, 54 percent of students receive Pell Grants and 77 percent of students hold employment. Fahey added, as a result of a variety of problems from income to inner city schools, these students were not college ready. Overall, 50 percent of YSU students have ACT scores within the 17-23 range, while 25 percent do better. In 2012, the average ACT score for the 354 black students was 16.4. 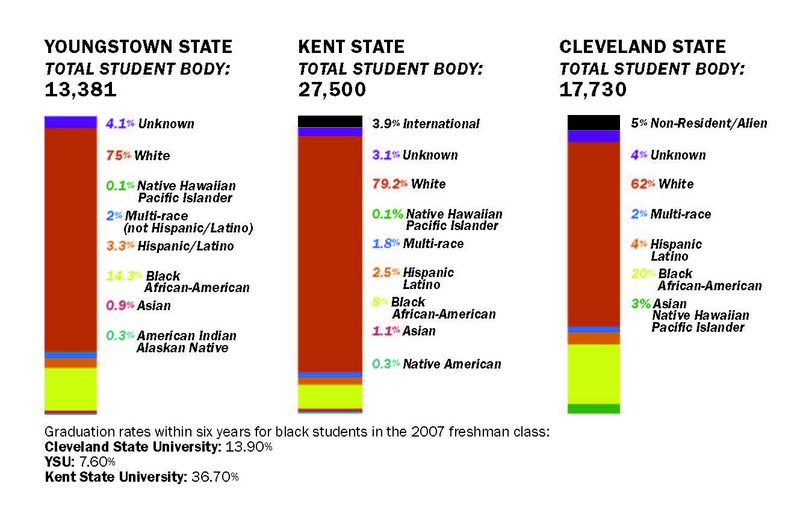 Kent State University boasted a 20.1 average for their 398 black students in the same year. YSU has also had persistently dropping black enrollment over the past 3 to 5 years. In 2013, 308 black students were admitted to YSU; in 2014, only 175 black students were admitted — a staggering 43 percent drop. Gary Swegan, the associate vice president of enrollment and management, said a portion of the decrease can be attributed to YSU’s economic troubles, an overall decrease in enrollment and YSU’s transformation over the past few years into a more selective school. In 2013, former president Randy Dunn announced stricter enrollment criteria with the goal of attracting more students with better academic credentials and a higher chance of success, due in part to a recent change in the Ohio higher education funding model. William Blake, the director of the Office of Diversity, said the change was necessary. “We need to make sure we are doing the very best we can in terms of graduation rates. Our bottom line is graduation rates. If we are not putting out a product, we are being punished for that somewhere down the line,” Blake said. Sylvia Imler, the interim director of Diversity and Multicultural Affairs, called the previous model “immoral,” allowing low-achieving students to rack up debt before inevitably failing or dropping out. Fahey emphasized Eastern Gateway Community College as a key element in preparing students for college — instead of forcing students who were not college ready to take remedial courses at YSU that do not count toward graduation, but cost the same. “They are in some ways more effective for those students than we were when we were trying to be all things to all people,” he said. Cryshanna Jackson Leftwich, a professor in political science, said the university has to do more than enroll better students — they have to retain them. The hope of the administration is that these changes in enrollment criteria will bolster minority success. Course completion for black and Hispanic students in the 2012-2013 academic year stood at approximately 69 percent and 78 percent respectively — compared to the overall course completion that fell above 80 percent. Fahey said there was no ubiquitous method to improving these numbers; improvement has to be approached at an individual basis. He pointed to a few successful programs YSU utilizes, such as Upward Bound, which supports inner city high school students and the Youngstown Early College High School and the Summer Bridge Program, which offers first-year minority students a weeklong introductory program. Blake argued that the university still has serious infrastructure and engagement issues to contend with in order to improve success rates. Julian Jones, YSU student and the vice president of YSU’s chapter of the NAACP, and Blake both said YSU needs additional resources like the multicultural centers found in similar universities across Ohio. “You see white students with other white students and black students with other black students and international students with other international students. You rarely find these students together mingling with one another. That’s why I think it is highly important that we have a multicultural center where we all as students can converse and learn from one another,” Jones said. Blake also recommended placing student needs in a singular facility to house all student services. He said sending students around campus for services discourage minority students. Blake and SaTonia Johnson, an office assistant at the Office of Diversity, both said their office contends with a significant portion of minority students’ issues. Swegan, Imler and Fahey said these centers were a goal, but they pointed to issues of funding that slow down progress. Imler said she has had to make budget cuts to her department three times in the two years she has been interim. She also said this issue of retention and graduation is not just an upper administrative problem, but also something in which the entire campus must participate. She said it is the priority of the teachers and the administrators to identify potential in students and help them flourish and to avoid pushing intelligent students off to Eastern Gateway simply because of a lack of experience. “When it comes to teaching, which is my background, teachers need to have the skills to be able to adjust and adapt according to the students’ context and not take the approach that they lack intelligence or are cognitively delayed. What you try to do is provide those experiences,” Imler said. Swegan agreed with these statements. “If a student has what we would deem to be potential, we still have the capacity to give that student an opportunity through conditional admission,” he said. Blake, Swegan, Fahey, Jackson, Imler and Anderson all agreed that YSU needs a more diverse faculty, staff and administration. 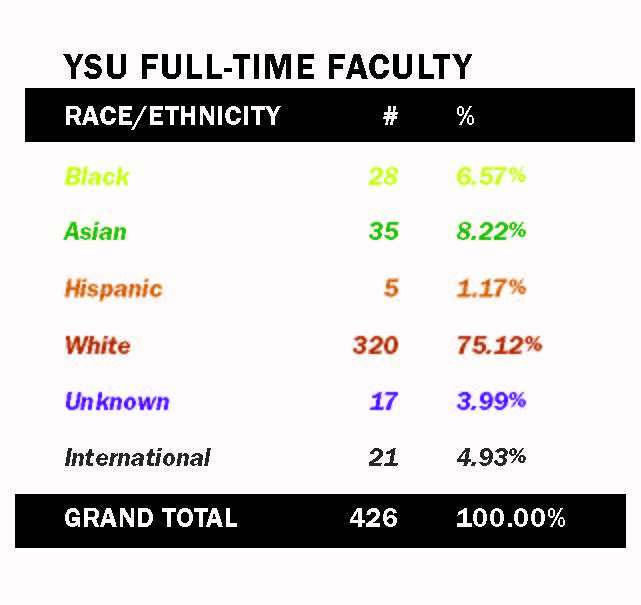 Of the 426 full-time professors on YSU’s campus, 28 — 6.57 percent — are black and five are Hispanic — 1.72 percent. These numbers poorly reflect the student body. Anderson said a more diverse faculty has a tangible effect on students. Alicia Prieto Langarcia, a professor of mathematics and one of the five full-time Hispanic professors, said she was nervous about the lack of diversity when she first began working here two years ago. Prieto said the number of minority professors in STEM is an even greater problem. The systemic reason for this roots back to a low minority count in STEM majors. At YSU, out of 2,653 STEM undergraduates, six percent are black and three percent are Hispanic. “In an environment where we are all losing resources it is very difficult to recruit and retain a very diverse staff,” Fahey said. Helene Sinnreich — a history professor, vice president of YSU’s faculty union and member of the Diversity Committee — said the root of this retention issue for some professors is a hostile work environment. “As a grievance officer, I watched a lot of diverse faculty leave in disgust. I see that underbelly,” she said. A public records request made by The Jambar only returned six grievances filed under the YSU discrimination and harassment policy 2001.03 by the four unions over the past 15 years. Sinnreich explained that many professors do not even file grievances. “A lot of what you’ll see is that people don’t have a great experience. Instead of filing grievances, instead of complaining, especially if you are an untenured professor and you have trouble with your chair, … If you are a highly qualified minority, [you have other options outside of YSU],” she said. The numbers as of April 13 for the students admitted for Fall 2015 show upward movement in minorities — 835 black students have been admitted compared to last year’s 455 admitted at this time and 179 Hispanic students have been admitted compared to last year’s 106. “Of our admitted pool, there is close to 30 percent that are something other than Caucasian that would lead me to believe that we would enroll a percentage that is at least at 19.99 percent [in Fall 2014] or at least a little better,” Swegan said. Swegan added that though YSU may not gain a large number of new minority students this fall, there will be a growth in quality if not quantity — the university’s current goal. “We got to get the numbers back, but we have to do it in such a way that will allow the students to be successful,” he said. The university has also created a new scholarship opportunity called the Trailblazer Award, up to $2,000 for first-generation college students, which the university believes will attract more minority students. Martin Abraham, YSU’s provost, said one of the primary reasons for the drop off in minority enrollment is poor recruitment. Swegan said it is an absolute necessity that YSU continue to extend its recruitment footprint beyond the traditional area — citing his projection for some of YSU’s main feeder high schools. Fahey said the university will not feel the full effect of these changes and initiatives made over the last few years until 2017. While YSU is working to improve the issue, faculty, student and administrators all emphasized its importance. Sinnreich said the university needs to become more prestigious in the field of diversity — pointing to the lack of a Higher Education Excellence in Diversity award that many competitors have won. Brian Glen, a psychology major, said YSU is a diverse campus, but it should better reflect the surrounding area of Youngstown — a city with a population of 65,184 people, 45.2 percent black and 9.3 percent Hispanic. Swegan said he was certain that the minority population is a key to YSU’s success. Additional Reporting by Christina Young, Tachieka Williams and Justin Wier.